An extremely quick review of the global adjustment: Essentially all Ontario generators are guaranteed payments, but there is a market operated. The market, such as it is, does not recover enough to pay the generators contracted, or regulated rates - and the difference is the global adjustment. I tried to get confirmation as to whether contracts (X) would be renegotiated, and the best information I received, from the Globe and Mail's Shawn McCarthy, was this was not being looked at. So... where Z is a calculated figure, the government is promising to reduce it without addressing the variables that produce Z. "We're refinancing the mortgage and setting a new term that stretches over a longer period," Ms. Wynne said. "Over time, it will cost a bit more. And it will take longer to pay off. But it is fairer – because it doesn't ask this generation of hydro customers alone to pay the freight for everyone before and after. The burden will now be shared more evenly and more appropriately." A significant problem with this explanation is that Ontario hasn't built much debt in building public generation since 1993. The bulk of the costs recently are from contracts. Since 2008 the vast majority (over 90%) of new-build generation is based on the German model of feed-in-tariff (FIT) contracts, mostly for a duration of 20-years. 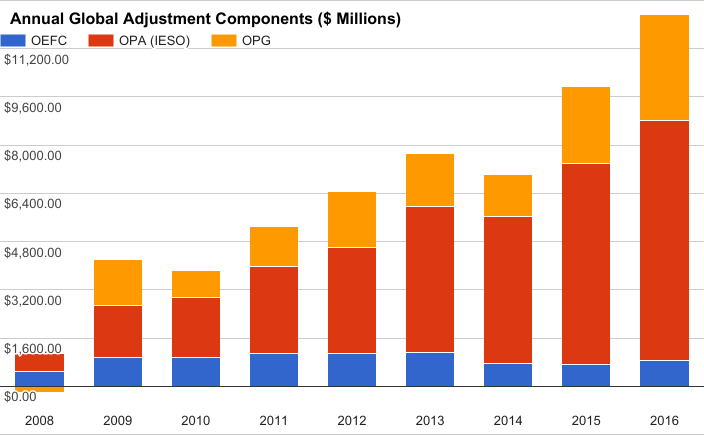 The following chart, of global adjustment components, shows how small the share of publicly owned, and financed, generation (OPG) is compared to contracted supply including OEFC (older), and more recent contracts signed by the OPA (IESO). It seems the current Ontario government intends on paying out the contracts, as signed, but financing the payments with debt replacing 20% of the global adjustment mechanism. I don't know if this is in keeping with any level of accounting standard. The Office of the Auditor General of Ontario has provided great insight into the electricity debacle (significantly in both 2011 and 2015 annual reports), and hopefully they'll delve into the implications of intending to collect payment from ratepayers years after the contracts have ended. Ontario not only just bought out non-utility generator (NUG) contracts; along with expired NUG contracts the province has seen 8 natural gas-fired power plants mothballed despite historically low fuel costs for these entirely depreciated generators. Germany, the jurisdiction Ontario copied feed-in tariffs from, may lose up to 13 gigawatts of industrial wind turbine capacity by 2023 as their contracts expire and market rates can't cover the operation costs. The Ontario government is expecting to run up to $25 billion of debt to cover the 20% discount in the global adjustment. By the time it anticipates recovering those funds, there will be no asset (the contracts) left! Another early feed-in tariff jurisdiction, Spain, didn't allow consumer rates to rise while madly writing contracts, and ended up with an "electricity tariff deficit." 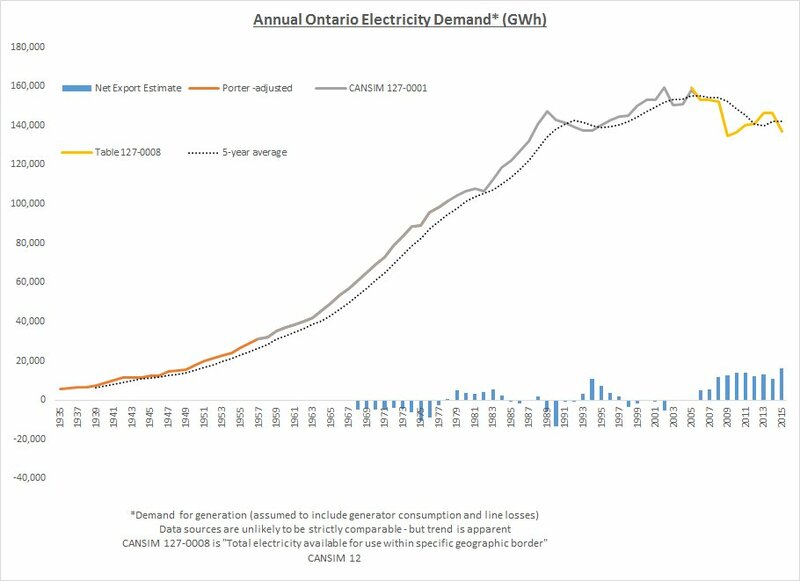 An electricity tariff deficit seems to be exactly what Ontario announced today, and that may be a good thing. A first step is recognizing the problem. Spain addressed it's electricity tariff deficit a few years ago by unilaterally cutting rates on the feed-in-tariff contracts. "Extend and Pretend" is a twitter poll result!